Almost every hotel and motel in the Palm Springs area has a pool. It is part of there entertainment package for guests that are staying there. But the very best pool in Palm Springs has to be at the Deauville. The Deauville is a condominium project located within two or three blocks from downtown Palm Springs. It is across from the Spa Casino. The pool that is shown in this picture is actually at water park and is a lot of fun for many kids. For this reason many adults would prefer not to go to this particular pool. That’s why we think that the pool at the Deauville condominium project two blocks from downtown Palm Springs is actually the best pool in Palm Springs. It is a private pool. It is only used by people who are staying in the condominiums or who are owners of condominiums at the Deauville. 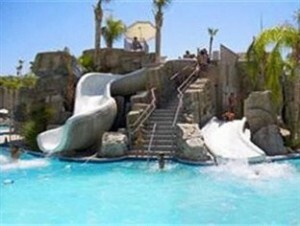 The pool at the water park is pretty good too and appeals to kids and teens who are looking for fun and excitement. Unfortunately it only opens in mid April. It stays open until late in the fall. But it is one of the best water parks in the city. At the Deauville you can choose from one of three pools. The largest pool is surrounded by palm trees and is kept at a standard 85° all year round. It comes with a hot tub and lounge chairs that you can relax on. There are two more pools on the property. They are smaller and they are heated as well beginning in March of each year. There’s also a hot tub. These pools are very quiet and an area where lots of people like to go to relax. At the larger pool there are obviously more people. It is an opportunity to meet fellow snowbirds that are vacationing in the area. Based on the properties that we’ve seen in the Palm Springs area and from comments in various people have made to us, this pool at the Deauville is one of the best if not the best pool in the entire city of Palm Springs. It is the largest pool, and it is also kept at it for a comfortable temperature all year round. The surroundings are tropical with palm trees. You can find shade as well as lots of sun. This is the best cool in Palm Springs.